Did you see the Southern Cal football game Saturday night? The Trojans dismantled the Ohio State Buckeyes. I’ve been a Southern Cal fan for almost as long as I’ve been a West Virginia fan (which is all my life, LOL) so I have enjoyed the recent resurgence of that storied program. The Trojans are a powerhouse again this year, and their quarterback Mark Sanchez is very impressive. Of course, SC is loaded at all the skill positions, as usual, but they are even stronger where it counts the most, on the offensive and defensive lines and in the secondary. There’s little doubt in my mind that Saturday night the two best active coaches in college football were standing on the turf at the Los Angeles Coliseum. Pete Carroll and Jim Tressel are both class acts that can coach the hell out of a team. But, you may say, what about Joe Paterno? Surely he is the best active coach in college football. Or Bobby Bowden? There may have been a time when I would have agreed that they were the two best, just because of their success. But both of them have stayed on far past their shelf life and lost control of programs that are now plagued with scandal. Paterno passed off the far too many crimes committed by far too many of his players as a case of “boys will be boys” and gave them little more than a slap on the wrist until ESPN publicized to the nation what we here in central Pennsylvania have known for years now. Penn State’s dirty little secret is now out in the open for all to see and it ain’t a pretty sight. Anyway, I digress. As much as I enjoyed watching the Trojans demolish their opponent Saturday night, there was a downside. Cousin Vickie is a big Ohio State fan. I know how disappointed she is. My Mountaineers took a similar drubbing at the hands of East Carolina last weekend. But on the bright side for cousin Vickie is that college football means hours and hours of me knitting. 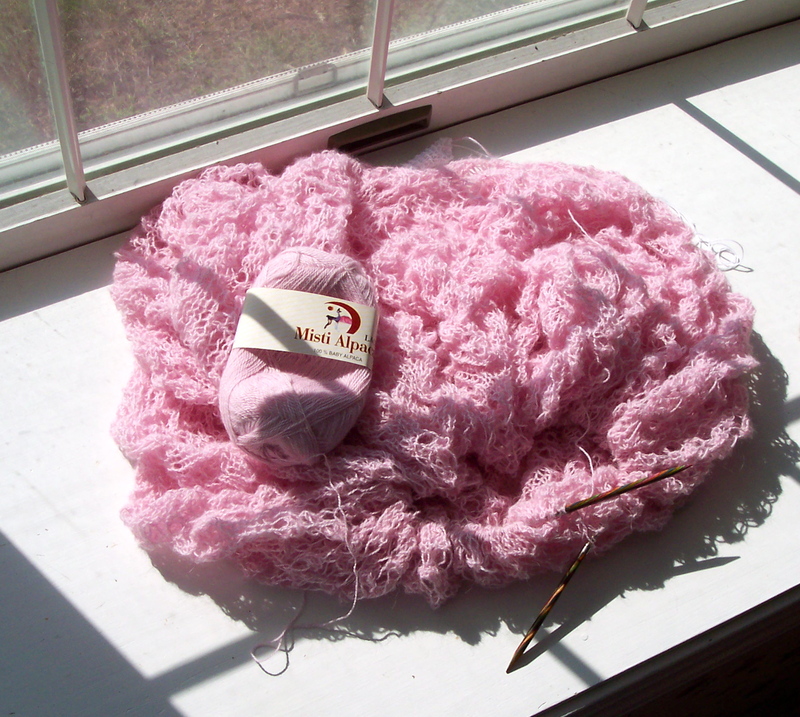 I’ve been working on MMario’s Spanish Armada shawl for Vickie in Misti Alpaca Lace and it’s ready to be cast off. I’m going to do a crocheted loop edging instead of the one MMario uses because after several failed attempts to get an edge that is stretchy enough and still looks good, I decided to go with my tried-and-true fall-back edging. It doesn’t look like much now, but once I work my magic on it, it will be transformed into a beautiful and wearable work of art. Thank you, MMario, for your lovely design.